Got a question? Message bloominfab. Orders will be dispatched by Royal Mail Second Class signed for service within 7 working days of payment. Postage & Packing ~ UK addresses. If you are not happy for any reason please let us know as soon as possible & return them to us, unused & in the original packaging for a replacement or refund. Postage & packing charges are not refundable. 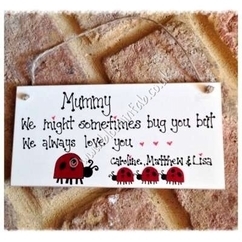 Personalised Items can only be returned where 'bloominfab' have made a mistake with the order. 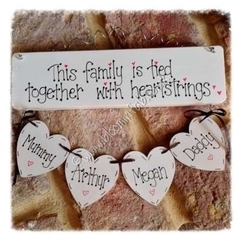 quot;This Family is tied together with heartstrings " is the lovely way to show how in love families are. Also a perfect gift for a special family you know! 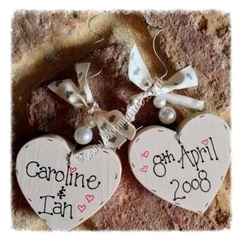 The sign is personalised with the names..
Personalised Wedding Hearts Â£16.00 These personalised wedding hearts feature the name of the couple and the date of their wedding. With ribbon bows and pearls these are very sweet reminders.. 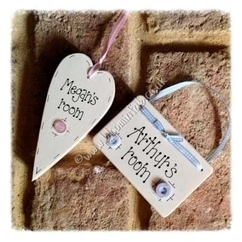 Handmade wooden personalised bedroom door sign. Ideal gift for birth, christening, birthday or party gift All plaques are handmade and handwritten. Colour is added through ribbon, embellishment etc..
Is your guy in the Military? 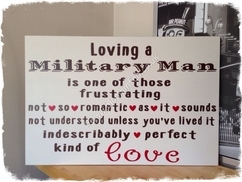 a sign to sum up what it really means to love your Military Man Can also be changed to loving a Military Woman Handmade wooden sign 400mm x 600mm x 9mm approx Sign is..
Are you counting down to meeting your baby for the first time? 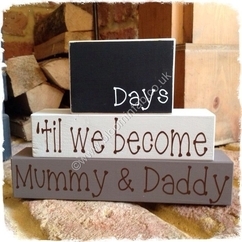 It doesnâ€™t matter how many days it is until he or she arrives, by using this personalised wooden birth countdown block..
quot;Me+grandad=trouble" is a great way to capture the close bond between grandfather and grandchild. Who else gets to spoil you like him? 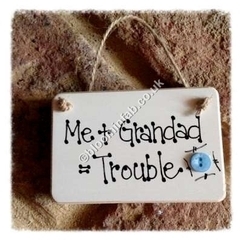 Grandad can be changed to your chosen name. wooden pine..
Everyone loves their Nanny simply inside and out? 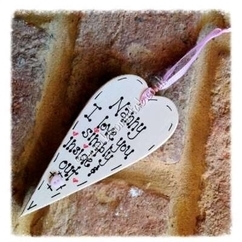 This handmade heart is a super gift for any occation (can be changed to Nana, Gran) 14.5cms x 6.5cms approx Plaques are all cream with black handwriting..
friends are like bras close to your heart & always there for support bra colour will vary pine plaque 10.5cms x 7cms x 1.5cms Plaques are all cream with black handwriting, colour add through.. 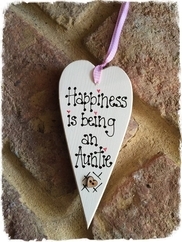 This handmade wooden heart shaped plaque would make a wonderful gift for a special Auntie in your life. To tell her how happy she makes you. 14.5 cms x 6.5 cms approx Handmade, hand cut, handwritten.. Everyday our little ones, or even big ones bug us, but bugging is good as that's what makes them grow into the adults we will always love. 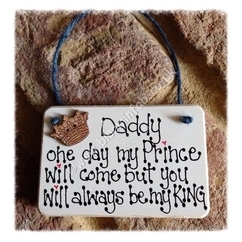 Mum/Mummy/Dad/Daddy/Mum & Dad/Mummy & Daddy we/I might..
Daddy One day my Prince will come but you will always be my KING A lovely little gift for a very special dad . 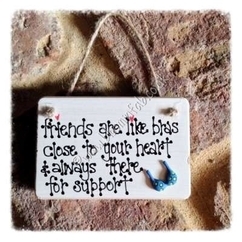 Handmade wooden plaque. 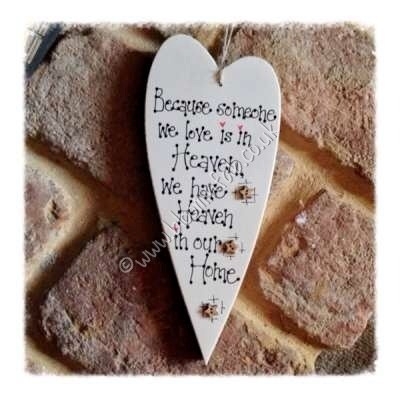 10.5cms x 7cms approx Plaques are all cream with black handwriting..